Paul Wyler, born in Basal in 1896, was a pioneer in the development of the balance in a watch. 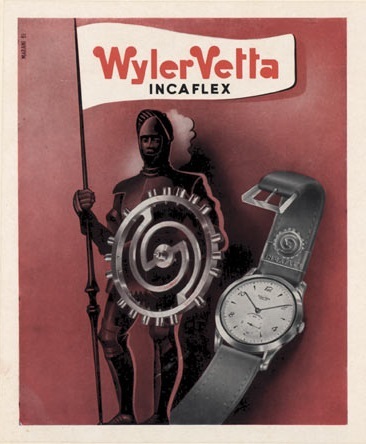 Together with his brother Alfred, they founded the Wyler brand in 1924, and in 1927 they patented the Wyler Incaflex balance wheel invention, involving a balance made from a single piece of metal and thus making it stronger. 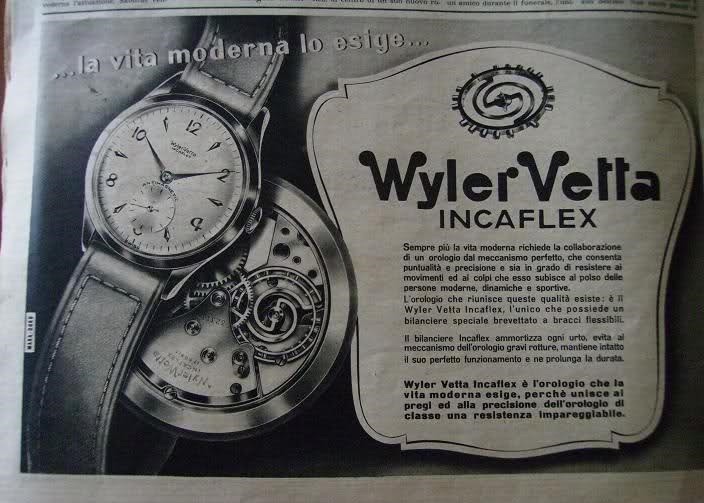 Old ads for the Wyler Vetta Incaflex balance wheel invention. A meeting with the Italian Lucia Binda became decisive for the brand. Together they created the brand Wyler Vetta for the Italian market. 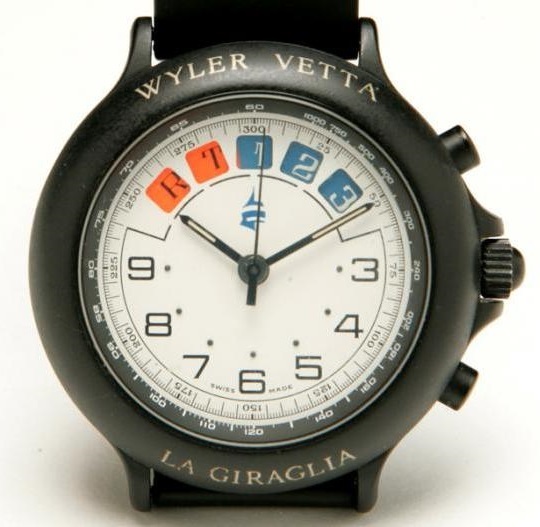 In 1993 however, after a difficult period during which the brand vacillated between the names ‘Vetta’, ‘Wyler Vetta’ and simply ‘Wyler’, the Binda Group purchased the entire brand, giving it the name Wyler Vetta. Wyler Vetta La Giraglia in two versions. Model: Wyler Vetta La Giraglia. 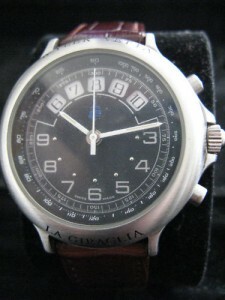 Reference: 775101, with matt black case and white dial, or matt silver coloured case with black dial. 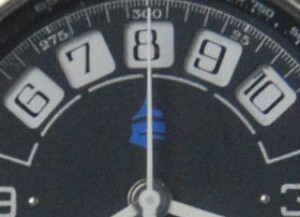 Caliber: automatic Valjoux 7757 regatta movement. 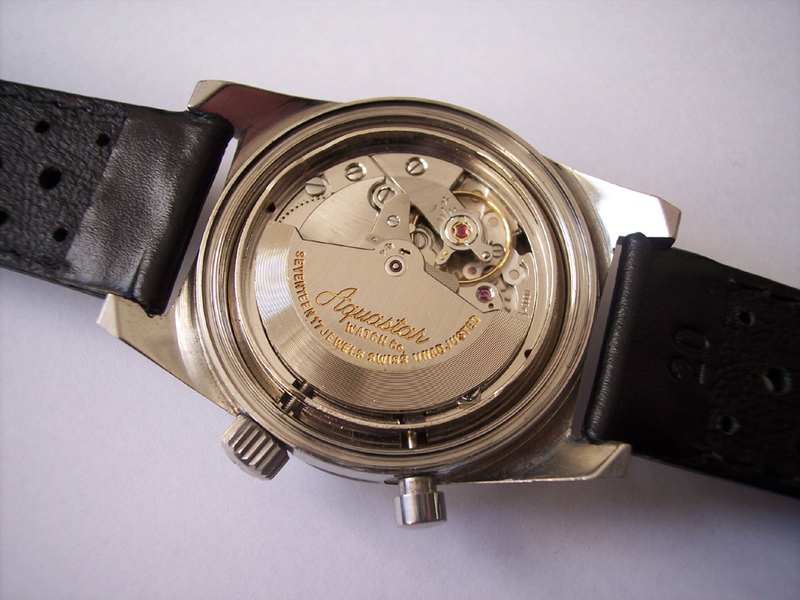 Case size: Ø 39 mm / H 14,1 mm. The Valjoux regatta caliber 7757 is described in the Atlantic section here. 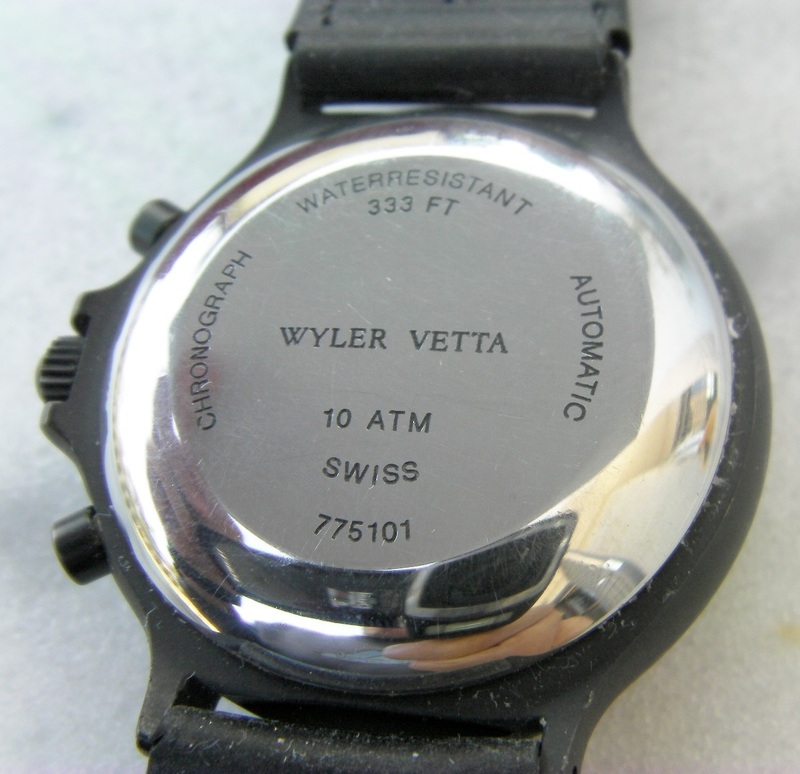 Only the Wyler Vetta has a different indicator disk. With the chronograph reset the five apertures in the dial show 10-9-8-7-6 as black figures on a white background. And after the first 5 minutes with the chrono activated at the first gunshot, it shows 5-4-3-2-1 as white figures on a blue background. 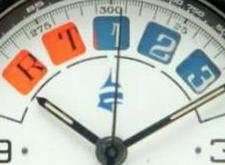 Again after 5 minutes, as the final gunshot sounds, the dial shows START in black capitals on an orange background. You have to push the stop pusher to stop the process and to stop the indicator disk revolving. The Giraglia Rolex Cup is a Mediterranean keelboat regatta, named after the island of Giraglia, which has been held annually since 1953. It is organized by the Yacht Club Italiano, with the help of the Yacht Club de France and the Société Nautique de Saint-Tropez. Since 1997, in which year the current name was adopted, the race has been supported by Rolex. 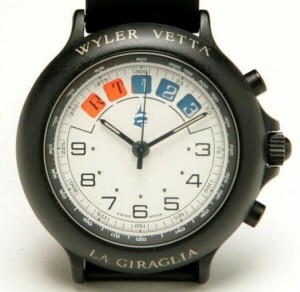 Wyler Vetta probably launched their La Giraglia yachttimer in honor to this event around the mid 1980’s. 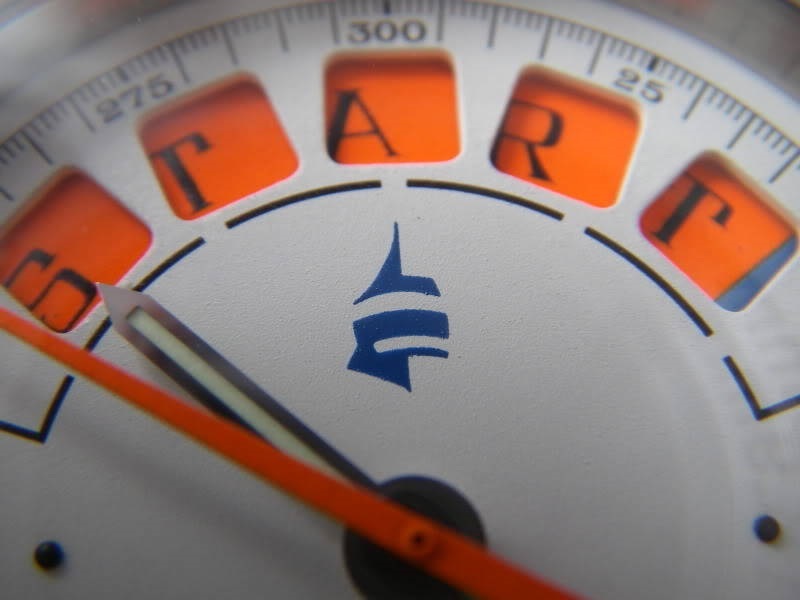 Although it has the same Valjoux 7757 regatta movement as in the Atlantic Skipper , the Eberhard Azzurra Regatta and the Memosail Automatic , there is only very little information to find about the Wyler Vetta yachttimers on the internet.